One of the most interesting things the Accidental Locavore ate on the recent Croatian trip was the dandelion buds that the chef at Toklarija had pickled. 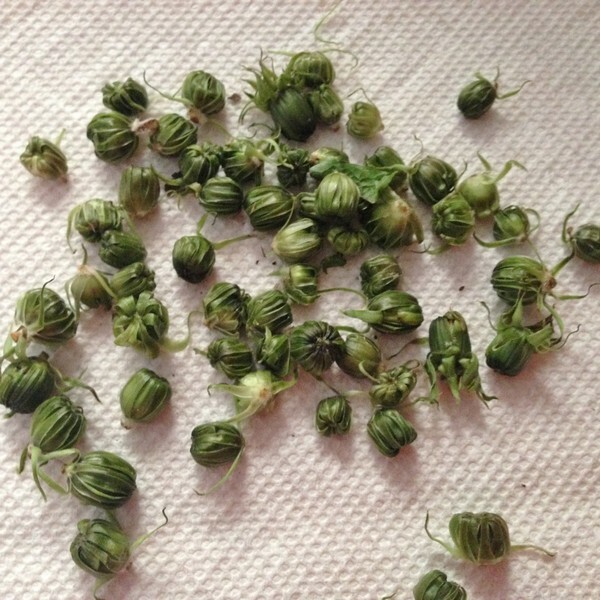 At first, they looked like capers and tasted a bit like them, but with a more interesting, complex flavor. As we toured the kitchen, he told me how he makes them. 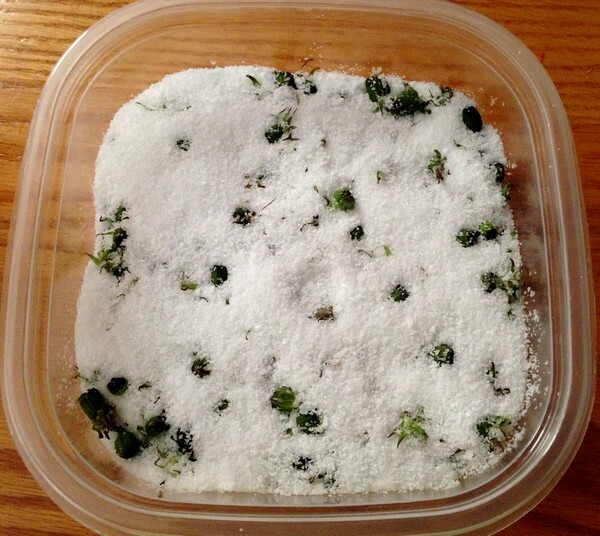 In a shallow container, put a generous layer of kosher salt. Add the buds and cover completely with another layer of salt. Leave them for 2 days. After 2 days, put the buds and salt in a sieve and rinse throughly. 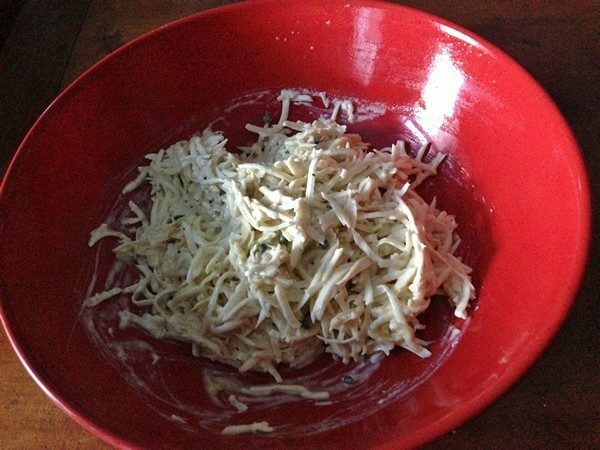 In a small saucepan over medium heat, put ½ cup white vinegar, ½ cup water, and ½ cup kosher salt. Heat until the salt is dissolved and the brine is simmering. 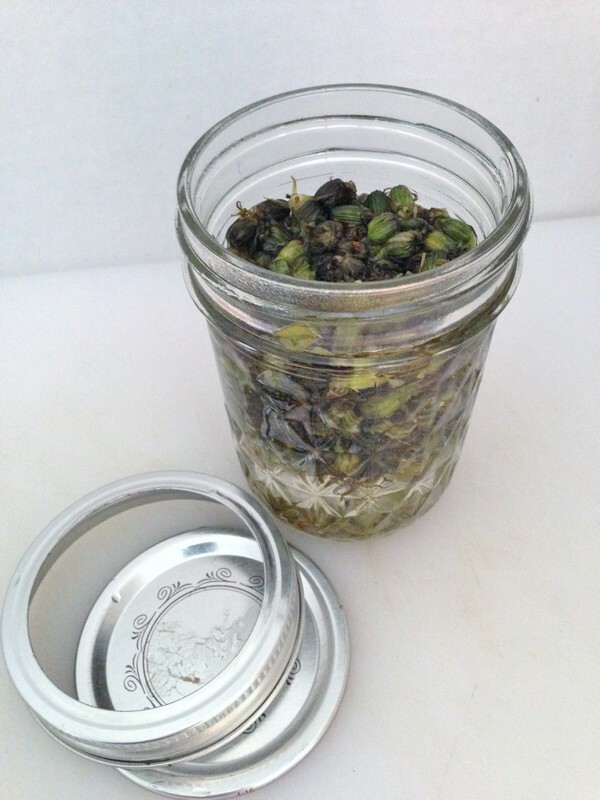 Put washed buds in a small jar (I used a 1 pint Ball jar) and pour the hot brine over them until the jar is almost full (leave about 1” of space). Cover and let cool. When the jar is cool, refrigerate. They’ll need a day or two to pickle. My verdict: Really good! Added bonus—possibly the yard will have a few less dandelions next year. It may be too late in the season to find buds, but as I was researching this, I learned that you can do this with a variety of buds, including chives and nasturtiums. As it turned out, my chives were just beginning to bud, so I clipped a few and added them to the jar. Where the dandelion buds were just slightly bitter, the chive buds had a hint of onion to them. Give it a try and let me know what you think. Have you been taking the easy way out and picking up pre-roasted chickens? Well, the Accidental Locavore is going to change your mind about doing it yourself at home! This is an easy, no-fuss way to roast a bird with nice crisp skin and added bonus: the veggies are roasted along with the bird. 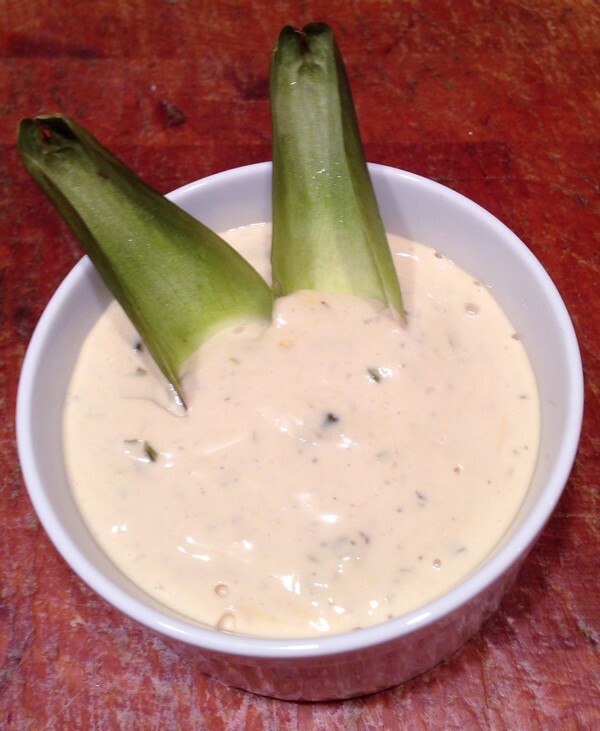 I adapted this from the New York Times and added asparagus. Feel free to add whatever is in season, just add them in sooner if they need more roasting time. If you don’t do this in the next five minutes, while ramps are in season, substitute scallions, which should work almost as well. 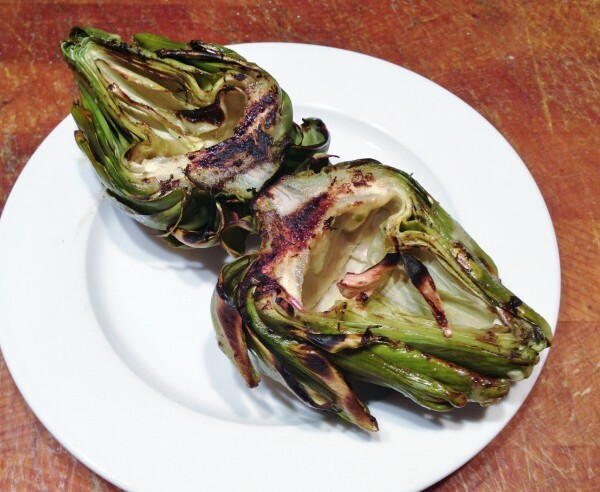 The Accidental Locavore adapted this easy way to roast a chicken from the New York Times. 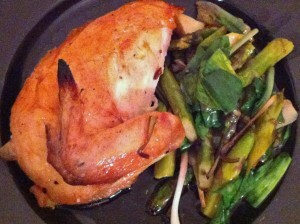 An easy main course recipe for chicken roasted with spring vegetables: ramps and asparagus. Rub the chicken inside and out with the salt and pepper. If you have time, do this 2-3 hours ahead of time and refrigerate uncovered (this will help the skin crisp up when you cook it). Place a large (10" or bigger) cast iron skillet in the oven and heat to 500 degrees. Leave the chicken out to warm to room temperature while the oven heats up. 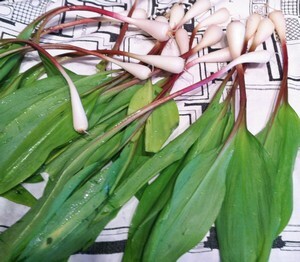 Prep the ramps: trim the roots from the bottoms and remove the outer layer of skin. Separate the leaves from the bulbs. 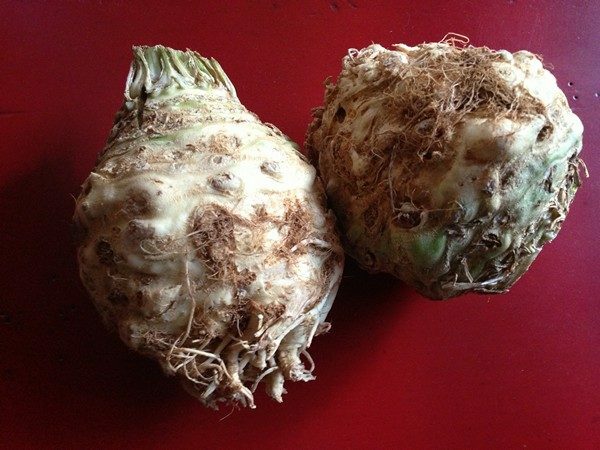 Cut any bulb fatter than a pencil, in half lengthwise. Cut the leaves into 3" pieces and set aside. Transfer the chicken to a cutting board, breast side up. Cut the skin connecting the legs (thighs actually) to the body. Spread out the legs until you feel the joints pop on each side. Place 2 of the lemon quarters in the cavity of the chicken. Remove the skillet from the oven and carefully place the chicken in it, breast side up. Remember the pan is really hot! Press down on the legs so they lie flat on the bottom of the pan. Drizzle the oil over the bird. Roast for 30 minutes. Add the ramp bulbs, asparagus, garlic and capers to the skillet. Stir to coat with the juices from the pan. Roast until the ramps and asparagus are tender and the chicken is cooked through, 10-20 minutes more (total cooking time 40-50 minutes). Remove the chicken from the oven and let rest for 5 minutes. While the chicken is resting, add the ramp leaves to the pan and stir until just wilted. Cut the chicken into serving pieces, and serve with the vegetables and the pan juices. Add the juice from the remaining lemon if desired. Serve and enjoy! My verdict: a great way to roast a chicken and having the side dish made at the same time is a big plus! Use a good quality chicken here, you’ll be able to taste the difference. Because I had them, I used Meyer lemons, which gave it a wonderful mellow lemon flavor that worked well with the ramps and asparagus. Tossing a few small potatoes in at the beginning might work but I would need a bigger cast-iron pan. What do you think?